Suggested planting rate: ten bulbs per 1 / ft sq. 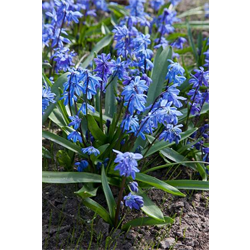 Notes: These Siberian Squill bulbs produce nodding, bell-shaped flowers on wiry stems with strap-like leaves. The blue Scilla Siberica is a vigorous naturalizer that multiplies by division and self-seeding.